After countless leaks and rumors and near confirmations, the smartphone line many have been waiting for is here at last. 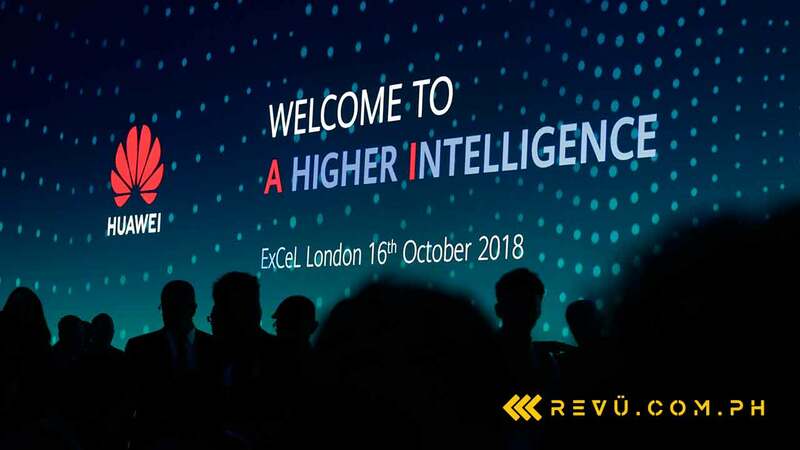 Huawei has drawn the curtains behind the Mate 20 and Mate 20 Pro flagship phones here in London. As widely expected, it is throwing everything but the kitchen sink at the competition, which includes the Apple iPhone XS and iPhone XS Max and the Samsung Galaxy Note 9. From front to back and inside out, the Huawei Mate 20 and Mate 20 Pro are the most incredible devices the company has ever built, which says a lot about how important they are for the tech giant and its long-term success. Sure, Huawei has moved into second place in global smartphone sales, ahead of major rival Apple, but it thinks it can become number one by 2019. The Mate 20 and Mate 20 Pro have a big role to play in making that happen, and Huawei is hoping that higher prices won’t be a big drag on consumers. The leaks turn out to be accurate: The Huawei Mate 20 Pro has pushed past the $1,000 (around P54,065) threshold that Apple and Samsung have crossed for the first time with their respective flagships. In Europe, the prices are set at €799 (P49,801 or $925) and €849 (P52,918 or $983) for the Mate 20 with 4GB and 6GB RAM, €1,049 (P65,384 or $1,215) for the Mate 20 Pro. Do keep in mind that taxes are higher in the continent than in many other markets, so they’re not necessarily indicative of how much the devices will sell for in your country. For customers in the Philippines, pricing hasn’t been revealed yet. Just take note of their predecessors’ prices. 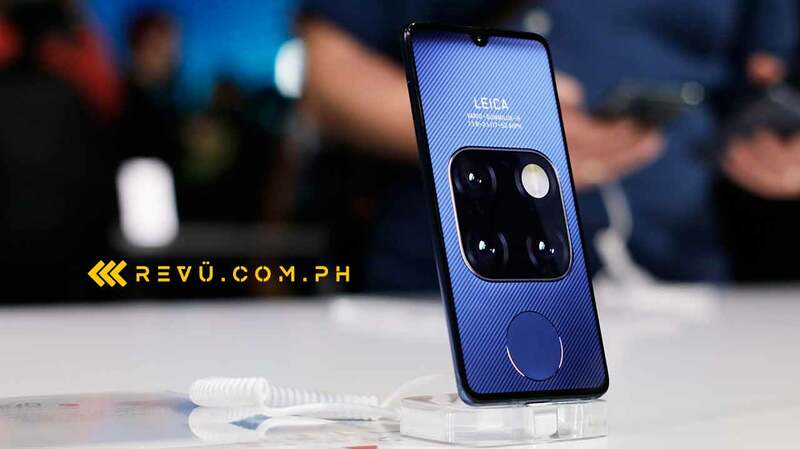 At the time of their local announcement, last year’s Huawei Mate 10 was priced at P32,990 ($610), while the upscale Huawei Mate 10 Pro cost P38,990 ($721). 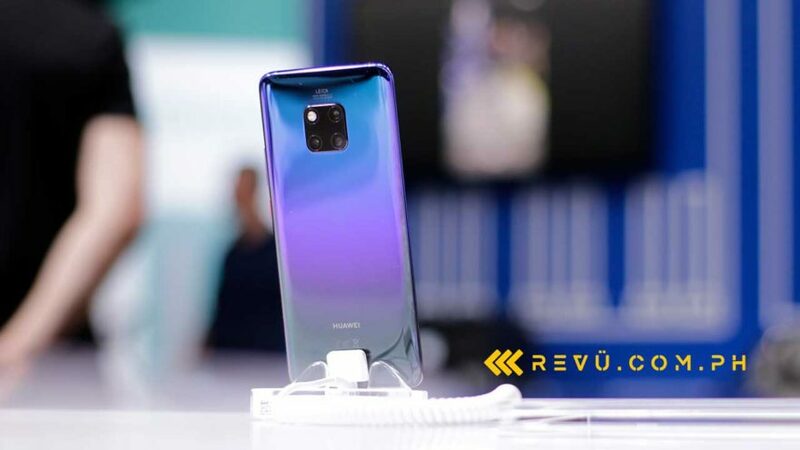 The Huawei Mate 20 series preorders have already begun in the UK and soon, in other countries like the Philippines. Your color options are Emerald Green, Midnight Blue, Classical Black, Pink Gold, and Twilight. The new Mate facelift has resulted in some of the best-looking, best-feeling flagships you’ll see this year. You get IP68 certification against water exposure with the Huawei Mate 20 Pro, too. The front of the Mate 20s offers more screen real estate, as well as reduced bezels and different-sized notches. There’s more screen this time around, but it feels like the overall footprint hasn’t changed all that much. The Mate lineup has always been about big, loud displays. The Huawei Mate 20 gets a smaller notch design. The Huawei Mate 20 Pro features a wider notch to make room for an advanced face-unlock system similar to Apple’s Face ID. It also incorporates an under-display fingerprint sensor, unlike the regular Mate 20, which adopts a rear-mounted fingerprint scanner. The LCD of the Mate 20 is 6.53 inches and runs at full resolution. 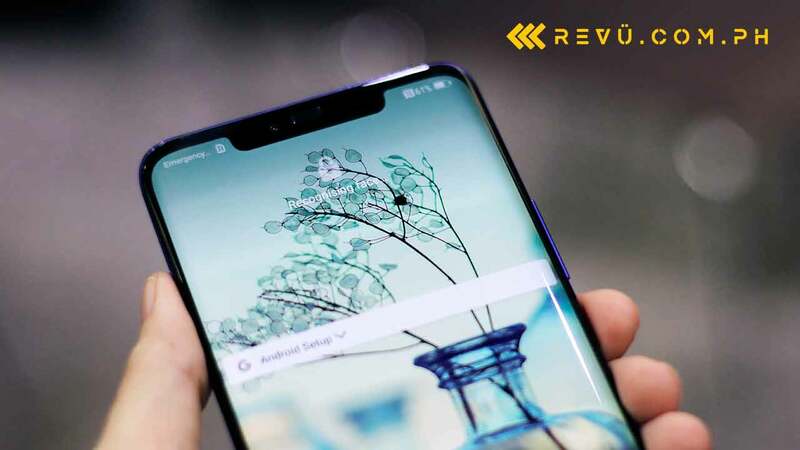 Huawei has adopted the smaller notch design of recent OPPO and Vivo devices to integrate the front camera. The Huawei Mate 20 Pro includes a wider notch to make room for an advanced face-unlock system similar to Apple’s Face ID. On top of that, it features a curved 6.39-inch OLED panel that’s not only brighter and has more contrast, but also incorporates a fingerprint reader into the screen assembly. The regular Mate 20 sports a rear-mounted sensor for identifying fingerprints to unlock the phone. The backings are still made of glass, but this time sporting an optical pattern for a textured feel in the hand. And the main camera system now fits three sensors instead of two in a quad-circle module. Both devices use the same design, although the LED flash is situated at the top-right corner of the Mate 20. On the Huawei Mate 20 Pro, the focal point is a 40-megapixel wide camera that combines four pixels into one for better quality. One camera has 20 megapixels and ultra-wide capabilities, for those times you want to capture an extended swath of scenery. The telephoto camera is 8 megapixels and capable of up to 3x lossless zoom. The selfie shooter packs a single 24-megapixel sensor. 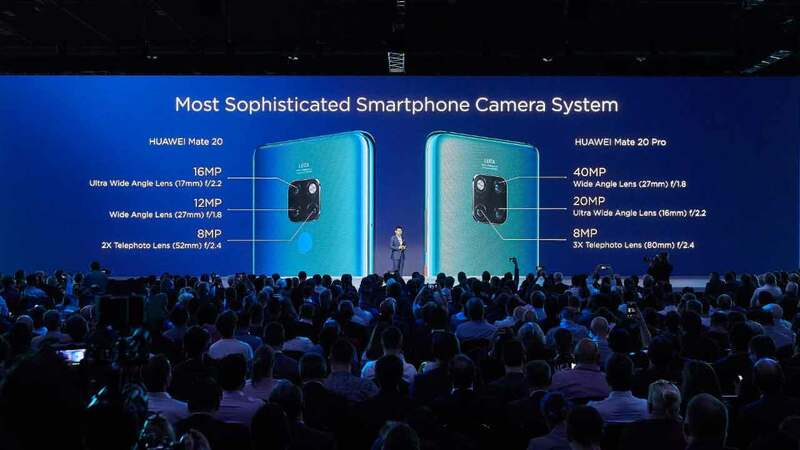 The Mate 20 drops the resolution to 12 megapixels and 16 megapixels for the wide and super-wide cameras. The telephoto sensor sticks to 8 megapixels albeit with lower magnification (up to 2x). Out of the box, Huawei’s Mate 20 units will come with the latest Android 9.0 Pie preinstalled featuring the equally fresh EMUI 9.0 overlay. The new Kirin 980 has long been expected to debut on these big-screen flagships, and it arrives with 128GB of internal storage and between 4GB and 6GB RAM in the Mate 20. The Mate 20 Pro offers higher memory configurations — up to 6GB RAM and 128GB of storage. For added storage, Huawei has unveiled a new type of memory card that can boost a compatible smartphone’s storage by 128GB. MicroSD cards are not compatible with the Mate 20s. The Kirin 980 represents a generational leap for Huawei, as it comes with the newest Cortex-A76 and Mali-G76 processors from leading chipmaker ARM. It’s also built on a smaller 7-nanometer architecture. Nanometer refers to the size of the transistors inside a chipset. The smaller the transistors are, the more of them you can fit into a chip. You want a lower number, because it indicates a faster and more efficient operation. Compared to the Kirin 970, the new Kirin processor is said to result in at least 20 percent better performance with 40 percent better battery efficiency. Early benchmark scores look promising. 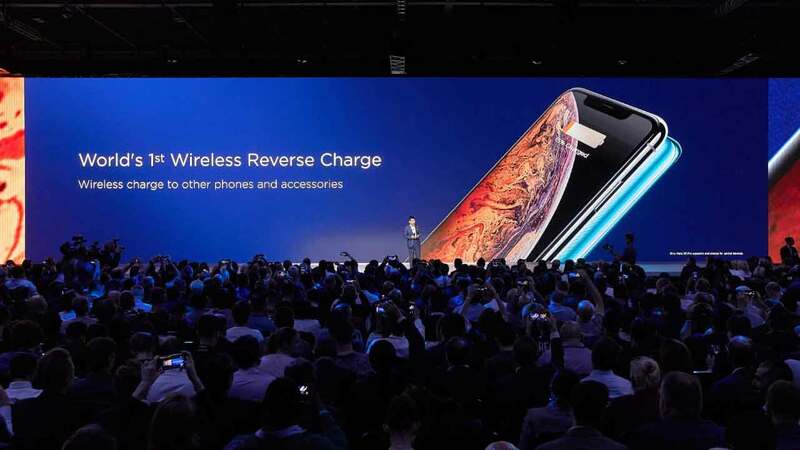 Finally, both models will enjoy incredibly fast charging under Huawei’s new 40-watt standard, one of the fastest in the industry. The claim is that you can get to 70-percent battery capacity in just 30 minutes of charging. We’ll be sure to test it out and keep you updated. The Mate 20 sticks to a 4,000mAh cell, while the battery inside the Pro variant has been bumped up to 4,200mAh. And both of them can wirelessly charge other phones and accessories.